Curry is one of the best dishes you will ever have especially if you love different mix of spices, just imagine mixing that with different types of seafood it will surely be an explosion of different flavours in every bite. 1. Heat 3 tbsp olive oil into a non stick pan. 2. Slice fish fillet into 1-inch squares. Coat with cornstarch. Add fish fillet squares to pan. Cook each side for about 2 minutes. Set aside. Leave the oil in the pan. 3. Add deveined shrimp to heated wok. Cook for about 30 seconds or until slightly pink in color. Do not overcook. Remove cooked shrimps and set aside. 4 . Add chopped onions, ginger and garlic and dried chilies. Cook until garlic is slightly brown. 5. Add curry paste. Cook until oil from curry paste separates. 7. Wait for mixture to boil again. Let simmer for 2-3 minutes. Make sure mixture does not dry out. (Add a tbsp of water if it does. ) Drizzle with lime juice. 8. Slice top of giant capsicums. Remove the seeds but reserve the tops. Place capsicums on top of a flat plate. 9. 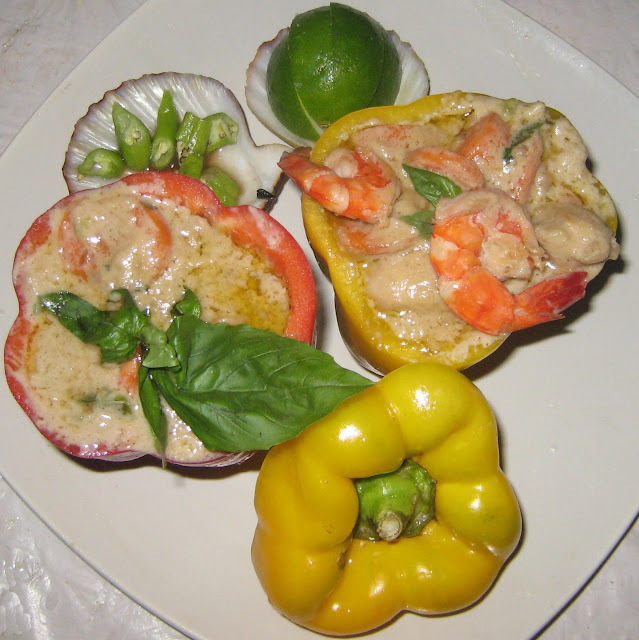 Halve seafood curry and transfer each half to the two giant capsicums . Place two shrimps on top of one of the capsicums with the seafood curry. Place the two whole basil leaves on top of the other one. Place capsicum covers where desired (on top or at the side). 10. Place two scallop shells on the plate. Put fish sauce on one scallop shell . Place sliced lime on top of the other scallop shell. Place excess seafood curry into separate bowl.